It’s been a rough week for Urijah Faber. As if having a UFC champion leave your camp wasn’t bad enough, Faber spent his weekend cleaning up the unspeakable after a drunk stranger wandered into his home, locked herself inside a bathroom and proceeded to lower real estate values. 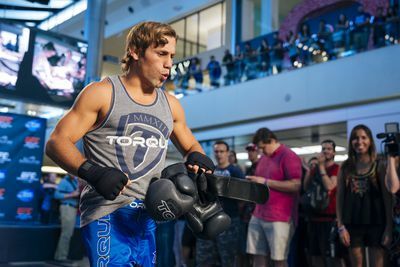 Faber doesn’t plan on pressing charges. Lucky for her, the woman is No. 2 on Faber’s s**t list. With the high-profile exit of UFC bantamweight champion T.J. Dillashaw leaving Team Alpha Male to join Colorado’s Elevation Fight Team, Faber says he’d have no choice but to accept a booking with his former protege.